With a new engine, new technology and a sleek new shape, the 2016 Honda Pilot is sure to retain its title as the 3-row crossover SUV to beat. 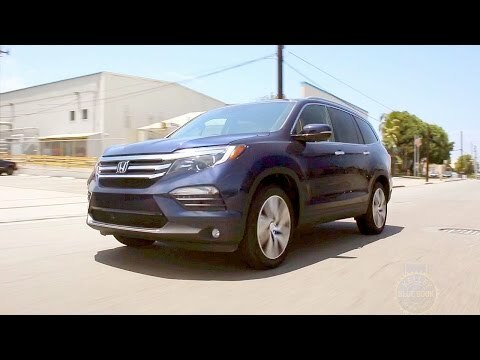 Yet it adds all this while sacrificing very little about what made the Honda Pilot so popular in the first place, with seating for up to eight passengers and smart cargo space. I have owned the car for 2 years and have had no mechanical/electrical issues. Taking it in for service has been easy and relatively inexpensive. It suits my needs for my canine/feline family and is easy to configure inside for their crates and other accessories we need. Driving it feels similar to a minivan. It is wide and large. However, when it is NOT in Eco mode, it has plenty of power and is quite zippy when you step on the gas. The only thing I was unhappy with is that Honda offers upgrades to their vehicles only as "packages" meaning you often have to accept accessories that you really don't want to get the things you need. Overall, I am content with this SUV as it meets all my size and configurability needs and, thus far, has been very reliable. My Honda pilot is very reliable. It has a third seat, seats eight (8) comfortably and has easy access to the third set of seats. The trunk capacity is large and, of course, even larger when the last row of seats go down. Putting the seats down in this model is very easy, just pull the lever or push the button. The trunk liftgate is hands free. Unfortunately, there is no receptacle outlet for charging your electronic devices in the back seat. The air conditioner works well, but is a little noisy and, of course, as with most of the Honda SUVs, road noise, in the cabin, is still a problem. However, it does have eight (8) cup holders with an extra small slots on each door of the front seat area. Honda pilot: your new family vehicle. This car is everything I dreamed of. It has great visibility in the “blind spot” that most crossovers/SUVs are really lacking. It has wonderful safety reviews. My husband can fit well without feeling cramped, our son has room for his car seat in the middle. 3rd row seating for when we need it (lays flat for more trunk room when we do not need the seating). Drives well with good gas mileage for the size of the car (22-24 mpg). Only issue so far is the rear air conditioner has broken but this is currently covered under our warranty. I really do recommend this car to anyone with a child or children. I do not even mind the monthly payment because it is so worth it. Honda (American Honda Motor Co.) is recalling certain 2016 Honda Pilot 2WD and AWD vehicles. The affected vehicles have fuel tanks that may leak. Honda will notify owners, and dealers will replace the fuel tank, free of charge. Owners may contact Honda customer service at 1-888-234-2138. Honda's number for this recall is KE8. Honda (American Honda Motor Co.) is recalling certain model year 2016 Honda Pilot 2WD vehicles manufactured May 4, 2015, to September 8, 2015 and 2016 Pilot 4WD vehicles manufactured May 7, 2015 to September 4, 2015. In the affected vehicles, when one of the safety systems such as tire pressure monitoring, anti-lock braking or electronic stability control malfunctions, there is potential that the instrument panel will not illuminate the corresponding warning light, however the warning lamps will illuminate when the ignition is turned off and then turned back on. As such, these vehicles fail to comply with the requirements of Federal Motor Vehicle Safety Standard (FMVSS) number 126, "Electronic stability control systems", number 135, "Light vehicle brake systems" and number 138, "Tire pressure monitoring systems". Honda will notify owners, and dealers will update the instrument cluster software, free of charge. The recall began on December 11, 2015. Owners may contact Honda customer service at 1-888-234-2138. Honda's number for this recall is JV7. Honda (American Honda Motor Co.) is recalling certain model year 2016 Honda Pilot vehicles manufactured May 4, 2015, to June 5, 2015. Due to an assembly issue, the third row seatbelt may be trapped between the rear seat and the rear sideliner. If the third row seatbelt is trapped, the occupants may not be restrained properly, increasing the risk of injury. Honda will notify owners, and dealers will inspect and repair the rear third row seat belt, free of charge. The recall began on August 6, 2015. Owners may contact Honda customer service at 1-310-783-2000. Honda's number for this recall is JS7.